Description: The QP shoulder purse comes in four sizes; tiny, small medium and large. 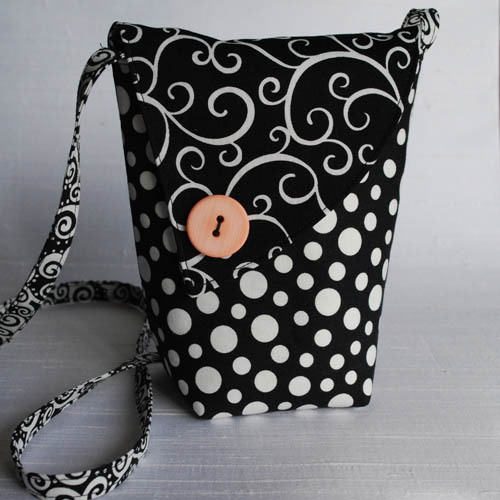 Patterns and instructions for all sizes of this fully lined purse are included. Small is just big enough to carry a typical cell phone, wallet, checkbook, pen, keys and minimal make up. Choose one that is elegant or fresh to complement your mood and outfit. Worn on opposite shoulder, the 44 inch shoulder strap places the purse on the hip of a 5 ft. 6-9 inch wearer. Focal vintage or custom button conceals the secure but easy-to-open and close Velcro closure. Medium and Large, each just a little bigger.